This Analysis has been jointly prepared by GTO & Vasudeva. Many thanks to Vasudeva for his support. Abbreviations used : MOM (Month on Month) and YOY (Year on Year). The New Year brings with it cause for celebration within the Indian automobile market. Passenger car sales shot up a massive 32.28% YOY and 26.57% MOM. Indians bought 1.5 lakh cars (hatchbacks & sedans) in January '10. This does not include the UV segment that is having quite a celebration of its own, what with a mega 54.67% increase in YOY sales! Both, the B hatchback segment and C sedan segment, continue their upward climb of about 39% YOY. But its the executive segment (10 lakhs and up) that has grown at nearly 60%. We also have a change in order; the Manza has taken Tata to the No.2 spot in overall sales (ahead of Hyundai). 1. No point comparing yoy figs and growth since the denominator was quite low (Oct 2008-Dec 2008). 2. Consider the yoy growths for various segments in sheet yoy. You will find smaller cars posting lower growth than bigger cars. This is because, smaller cars were less affected by 2008 collapse than bigger cars. 3. One month growth is misleading. Consider Q2FY2010 (July-Sep 2009) and Q3FY2010 (Oct-Dec 2009) as to whether the industry is sequentially reporting higher numbers. That leads to the conclusion that growth is there but not that high as reported in PRs (they give yoy and quote 100% as if customers are standing in line outside dealerships). Can you seriously consider 100% growth in any industry (except mobiles in the early 2000s). 4. Anyway, Q3FY2010 has not been so great but still better than Q2. Refer column CC and CD in sheet `fig'. Losers are Punto, Ford (nearly all segments), Fusion,Jazz, Indica, Hyundai Accent/Verna. Some successes: City, Cruze. On the Cruze point, I have seen so many spikes for GM (as anyone can see from this xls. sheet). Only 2-3 quarters of this spike will lead me to think that Cruze is a success. Last edited by GTO : 10th February 2010 at 15:02. - The 800 trundles along in line with its expected 2,500 monthly average (2,494 cars). However, we see the Nano gaining traction. Production seems to have freed up noticeably, with 4,001 Nano’s sold in January 2010. This is an improvement over its previous supply constraints allowing only 2,500 cars a month to roll off the temporary line in Pune. Oh, Ms. Banerjee! If it weren’t for you, we’d be looking at 5X the number today. The Gujarat plant is still 8 – 10 months away from being ready. Those of you who’ve booked and have a middle-of-the-range que number will have to wait longer. - As if Maruti was not dominating enough already, the VFM-Master has set an all new record in January. 58,540 B segment hatchbacks…the highest till date for the company! The Alto, Swift, WagonR and Ritz (in that order) are riding high on success! - A distance second are the Hyundai sisters (i10 & Santro, followed by the premium i20) for a total of 26,949 hatchbacks sold. Just as Jan ’10 was a record for MUL, so it is for Hyundai too. This is their highest sales performance in the segment ever. While the i10 is undoubtedly a market favorite (selling more than the Santro too), the 6 – 8 lakh rupee i20’s success has even left Hyundai managers surprised (average of 4,000 cars a month). - After a lull in December (4,228 cars), the Indica & Indica Vista climb back to their January ’09 levels. In fact, the number is near identical at 11,448 (Jan 2010) and 11,433 (Jan 2009). Despite the segment growing by 20% in this period, the Indica siblings have failed to register any increase in sales (negative market share). While 11,000 cars a month is highly respectable, the poor functional area handling of the Indica Vista (marketing, sales, image etc.) have limited an otherwise competent hatch’s success. - Firm in the No.4 position, and only poised to climb (thanks to the Beat), GM has sold 6,730 hatchbacks! GM’s cash registers mustn’t have stopped ringing….this was GM’s record month too. They’ve never seen such numbers. Thanks to the Spark, the General has always maintained an average of 3,200 hatchbacks per month. The well-priced Beat will add another 3,000 – 4,000 units to that tally. All the more impressive when you consider that GM India was fighting bankruptcy PR only 6 months back! - The Punto had a disastrous performance in December with a mere 532 GP’s sold. A recovery in January 2010 brings them back to the 1,200 level (1,256 to be precise). I don’t see any positive change in this number in the near future, as it’s barely 6 months from the time of launch (cars generally sell better in the initial quarter or two due to pent up demand). The Punto – as Fiat’s mega come back car - has fared below manufacturer expectations. In fact, the hatch sells only 20% more than the 8 – 9 lakh rupee Linea sedan. - The Fabia continues to fire away with one cylinder less…..and the sales reflect just that. Fabia sales are extremely dependent on promotions; that explains the roller coaster sales graph of 2009. Up one month, sharp drop in the next (from 196 cars in a particular 2009 month to 767 in October). 794 Fabias moved off showroom floors in January 2010, a recovery from the mere 291 sold a month back (Dec 09), as well as the 238 sold 12 months ago (in Jan’ 09). - Honda’s got no choice but to swallow a bitter pill each month end that the Jazz score card comes in. Jan 2010 marks the second lowest selling month for the pricey hatch with a paltry 490 hatchbacks sold. This is Honda’s first real failure in the market. Nothing to do with the product, all to do with the price. - The Dzire continues its successful run in the C Segment. Alongwith the SX4, Maruti sold 9,000 sedans (8,995) last month. The Dzire is a huge contributor to Maruti’s bottom-line. After all, its only a boot stuck on to a best selling hatch (read = thick profits). Yes, the delivery wait periods continue. Personally, I think the Dzire is a very average sedan. But then, it’s a Maruti + boot + diesel. Voila (to the eyes of the typical Indian car buyer)! - The competent Manza does the job and brings Tata the best ever performance within the C segment. A whopping 7,258 Indigos (Manza, CS and a sprinkling of Marinas) found new homes in the first month of 2010. The Manza shows that Tata’s R&D have come a long way. Good to see the sales reflecting just that. - The all-rounded Honda City maintains its lead in the premium C segment with a sales tally of 4,485. The City is a “can’t go wrong” sedan and clearly, the market is willing to pay a premium for its peace of the mind ownership experience. - Hyundai books spot no.4 with the Verna & Accent. A substantial YOY improvement (Jan 2009 = 1,687), yet about in line with its 2,400 car average of the last year. Things are expected to stay the same for Hyundai in the C segment. Period. - It’s raining discounts at Ford with one special edition Fiesta after another. 2,138 Fiestas + Ikons moved off showroom floors. About a 20% YOY improvement. - The Linea starts the new year with a respectable 1046 score. Not bad for a 8 – 9 lakh car and shows that the market will accept an entry level diesel sedan from Fiat, over a premium hatch. Why do I say this? Simply because in terms of segment-wise marketshare, the Linea’s performance is far superior to that of its cheaper hatchback sibling. - The one thats heard no less criticism from us – Mahindra Logan – is taking an equal beating in the market. 555 units sold. Price it right the next time, Renault! And while on lackluster performances, HM closes at 755 (Ambassador, Lancer & Cedia in that order) and the Aveo at 352. Think about it for a moment : The 60 year ol’ Ambassador sells more than the Lancer and the Cedia. Do you think that’s enough to tell HM-Mitsubishi that they are doing something wrong? Well, apparently not. The 10 lakh rupee favorite – the highly practical Altis – retains its no.1 position in the segment with its best ever performance in over 12 months. 924 Corollas sold. The Laura & Octavia bring Skoda to P2 with a combined 761 units moved. The “quick” Chevy Cruze (and about a 100 Optras) takes the flag half a lap behind at 737 cars sold. The Honda Civic now sits at position no.4 with 644 sedans sold. The Skoda Superb and Honda Accord continue their 20 lakh rupee fight, with the former maintaining its lead. A whopping 326 Superbs found customers in Jan, followed by 288 Accord buyers. The backmarkers? VW Passat (57 cars), Nissan Teana (30 cars), Hyundai Sonata (29) and Camry (23). I’m willing to bet that a majority of these were lapped up by the Hotel industry (via the cheap EPCG scheme). In a reversal of roles, the BMW 3 series smacks out the C Class (192 versus 131), but the E Class emerges as a leader of the 50 lakh segment over the BMW 5 series (245 versus 113). Merc’s going to be rolling in cash with the E Class alone accounting for 122.50 crores in sales (245 E Class X 50 lakh rupees). In a single month. Importantly, Mercedes snatches back the position of the best selling luxury marque in India (just as BMW had, exactly a year back in January 2009). The A4 & A6 continue to work their way up the ladder with a combined 136 luxo-sedans sold (A4 and A6). Audi did sell 21 in the same category, but the number includes the A8 and the Q7. What Maruti is to the hatchback segment, Mahindra is to Utility. No one touches M&M in semi-urban and rural India. Proof? A massive 14,425 UVs sold last month. While the Scorpio & Xylo may be relatively newer products, the Bolero is still the best seller by a mile. The Omni may be painfully old and basic, yet the Van brings the moolah home. Alongwith the Versa / Eeco, Maruti’s sales tally in the UV segment is 10,923. Third spot goes to Tata who managed 3717 UVs (Sumo, Safari and Winger). The cheap but rugger ACE Magic is Tata’s best seller with 4,657 UVs moved. Tata really lost focus of its hold over the UV segment, thanks to the development of its passenger car division (Nano, Manza, Vista). Toyota sells more UVs than cars in India, and the Fortuner has only strengthened this position. Total sales tally of 5,042 which includes about 4,000 Innovas, then Fortuners and a handful of Prados. I don’t expect more than 1 – 2 Landcruiser 200 series (if at all) in January numbers. GM’s Tavera moves along with its 1,000 – 1,200 monthly sales average. Alongwith the Captiva, GM sold 1584 UVs. Even after the Fortuner, Ford’s repositioning sees the Endeavour procuring a respectable number of orders (315 sold in Jan). Mitsu is doing about a 100 Pajeros (111). The BMW X3 & X5 sold a cumulative 16 SUVs. the Manza has taken Tata to the No.2 spot in overall sales (ahead of Hyundai). The Lull in December 2009 sales for TATA and FIAT are due to Plant shutdown/maintenance. Last edited by Zappo : 9th February 2010 at 20:27.
makes me wonder if Mitsubishi is serious about India market... alarm bells should have started ringing years ago yet we see no change of tactics from their side! In the UV segment, any stats available on Force Motor's performance? Thanks GTO ! Your analysis is the most awaited on this forum. Looks like the Indian economy is booming and actually helping some global car makers come out of the red. Extremely proud that an indian brand like TATA is finally learning to dominate it's local turf. I also feel the indian customer is slowly maturing and is learning to pick his/her car according to the needs and VFM proposition it offers. You are bang on about Jazz. Outstading car with no VFM price tag and hence the punishment from the market. As the young professionals get added into the "first car" market at a rapid pace, there should more exciting times for car makers in India . May the tribe increase ! Thanks for the Great review GTO.I was waiting for this for a long period. Hyundai should do something in it's line up with i10/i20 because there is very serious competition a head with Figo/Polo/Mirca.They should reduce the or more features to keep up the market mainly i20 market when polo is out.I feel Verna needs a replacement by 2011 to face more competition. Last edited by Sudan_NFS : 9th February 2010 at 18:17. Brilliant analysis GTO & Vasudeva. Keep it up. The coming months should be even more interesting with the launches lined up in the B-Seg: Figo & Polo. Ford's market share is pretty pathetic considering that they were one of the earliest MNCs to set shop here. Clearly shows the lethergic attitude of the management here and their corporate bosses. They took so long to launch a small car. If they knew their business, they would bring in a UV into the market. UVs are their bread and butter in America after all. Last edited by Gilead : 9th February 2010 at 18:29. I hope other manufacturers take a cue from GM and offer better value for money packages. Excellent report, as usual, GTO! What FIAT is missing in Punto that GM doesn't have to battle with Beat? 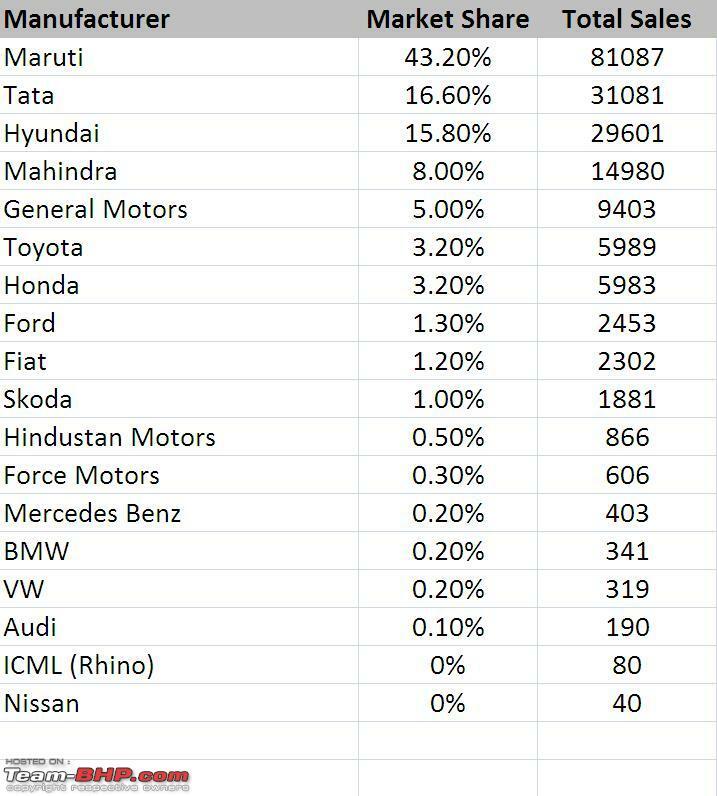 1) Maruti small cars are really bringing in massive sales, which are high numbers actually speaking. Their small cars have registered more sales than overall sales of No.2 manufacturer in India. They do have a practicality advantage over others. 2) Fiat. I dont know what is exactly wrong here. GP is better than Vista IMHO, but is still not getting more sales. And the most significant reason is the shared dealership floor space with Tata. Tata products do represent higher VFM than Fiat and Tata has made an image out of Indica and Indigo. Even though slightly associated with Taxi, the image is good enough and this pulls in more customers. Kudos to tata for successfully building such an image for itself, as its helping Tata now as compared to its competitors. 3) Fabia is still selling despite the presence of other good hatches ? Surprising considering what are realities of Skoda. 794 is a big figure by Skoda standards and for the car with that price tag + three cylinders. 4) HM-Mitsubishi, just do something and come up with some better products. Not that the current are not good, but the competition has moved on to a very high level. Either shut down shop or bring some new products. 5) Eeco seems to have done what Maruti had expected, bring in sales. Normal sales of Omni are generally in between 7-8K, but after Eeco, there seems to be a small jump which is surely because of Eeco. Lets see what future has got for Eeeco. Maruti had expected 40K units, means around 3300 units per month, and it looks like they are near to their targets. 6) Bolero still surprises me. The car is from Qualis era with original 68 bhp sumo. Then came is Turbo Sumo called Victa, came in Tavera, then came Innova, but Bolero is now since long a best seller, the M800 of Utility segment. 7) Altis leading is not surprising as its more practical than Civic and others, but I was expecting Cruze to take the lead. Innova getting good sales is again not a surprise.